England scrum-half Dickie Jeeps made his Test debut for the Lions before his England bow, one of a small number of players to do so. 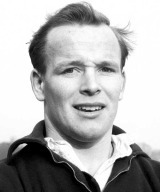 An intelligent player with great service, he formed an wonderful partnership with Welsh fly-half Cliff Morgan on the 1955 tour to South Africa. Jeeps would make his England bow in January 1956 against Morgan's Wales, but was unceremoniously dropped following a defeat. He regained his place a year later and would go on to captain his country on 13 occasions - also the number of caps he garnered for the Lions before his final Test, again in red and against the Springboks.